Steiner, a manufacturer of tractors and attachments, unveiled its newest tractor model—the 450DX—at the 2018 GIE+EXPO. The new tractor includes a 25-hp, air-cooled engine and a single-speed transmission. It provides control on slopes of up to 30 degrees (when equipped with dual tires on front and rear axles). The 450DX features the same oscillating frame, articulated steering, 4WD and Quick Hitch attachment system available on all Steiner 450 tractors. 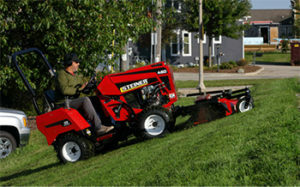 It’s capable of handling a wide variety of attachments to help users mow, blow, plow or dig. Accessories for the 450DX include hand controls, a level 2 suspension seat, dual wheel kit and rear weight kit.